Proprietors Greg & Judy Halloran appreciate your custom and welcome any comments you wish to make towards our ongoing commitment to the well being of your pet! Please phone during business hours for bookings & enquires, if it goes to message bank, it means we are busy looking after our four legged friends, we will get back to you ASAP. 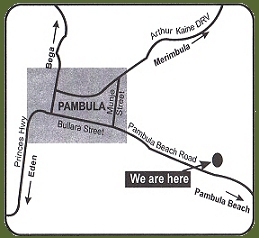 From the South: As you drive into Pambula, continue without turning, you are now on Pambula Beach Rd. Approx 2km past service station on left, look for our sign just past the 80km zone sign, down the same drive as the Anglican College. 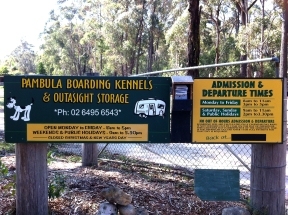 From the North: Follow the signs for Pambula Beach, turn left a T intersection at bottom of Pambula Village, you are now on Pambula Beach Rd. Follow instructions as above. Storage also available for caravans, boats, trailers etc at reasonable rates. Enquiries welcome!